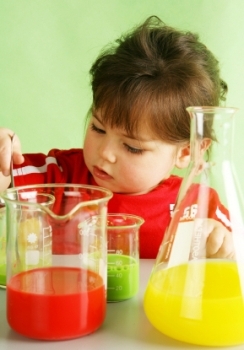 Really FUN kids science games that are great for toddlers. This is a great little free kinds game that should be played with mom asking the questions. Everything you need you can find around the house. It teaches your toddlers to think about things a little while having fun. They are never to young to learn interesting stuff. It's called "Will it sink or will it float" ? How to play kids science games "Sink or Float"
You get the idea anything small but water resistant will do, so go and hunt around your home. 2. Take a large baking bowl and fill 3/4 with water. Not such a big bowl that your little ones can fall into it .Then place in the center of the kitchen table. 3. Gather your kids around the kitchen table and as you hold each item over the bowl of water you ask the question "Will it sink or float". 4. Then let the item fall into the water to find the answer. have a reasonably big supply of items to test out with. You will probably find really young toddlers more interested in just throwing your items into the bowl. (they behave like children sometimes, what's that all about dear me :-) So mom must supervise at all times and keep order. This just one of those fun learning games for kids that they will keep asking to play again and again testing new sfuff each time.